When Marcus Kondritzer, Baron Gold, and Jerome Frank joined together in 1957 to form Kondritzer, Gold & Frank, they started more than just a law firm. Kondritzer, Gold & Frank began their practice with an emphasis on representing injured people throughout the Cincinnati Metro Area and southwest Ohio in workers' compensation claims, social security disability, and personal injury. Focusing on these areas of the law, they quickly earned respect and an excellent reputation for the quality of their work and for the way they treated their clients. Our current partners, James Crowley, Edward Ahlers, and Neil Roth, all had the privilege to practice with these three great mentors, learning much from them about how to effectively represent injured or disabled people and, just as important, how to treat their clients with respect and dignity. We listen to our clients as they tell us their needs and goals. We are responsive to their questions and concerns. We make ourselves available and easy to reach. We make whatever effort is necessary to make sure that our clients understand the law and the options that they have available and we keep our clients fully involved in the legal and decision-making processes. Be a part of our tradition. No case is too large. No client is too small. 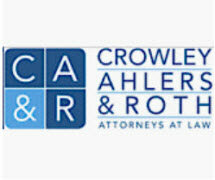 For questions about nursing home abuse and neglect or medical malpractice in the state of Ohio, contact the law offices of Crowley, Ahlers & Roth in Cincinnati today and speak with an experienced, aggressive, and successful lawyer about your concerns.